I picked up a copy of Remixed by Beachbum Berry. I own, and have made many a drink from the Grog Log , but when shopping at Oceanic Arts for this year’s Tiki Party back in August I spotted and decided it’s worth having this too. Besides another cocktail book in there, I also just love browsing through all the photos and art. Whenever I find myself with a half a jar of pineapple juice, or a nearly empty can of coconut cream, I consider it Tiki time in the house. Today it’s pineapple juice. Coming out of the Intoxica! section, and because there’s Campari in it, I’m trying out and altering very slightly, the Jungle Bird. Combine all of the ingredients in a shaker filled with ice. Shake and strain into a rocks glass filled with ice. Add garnish. 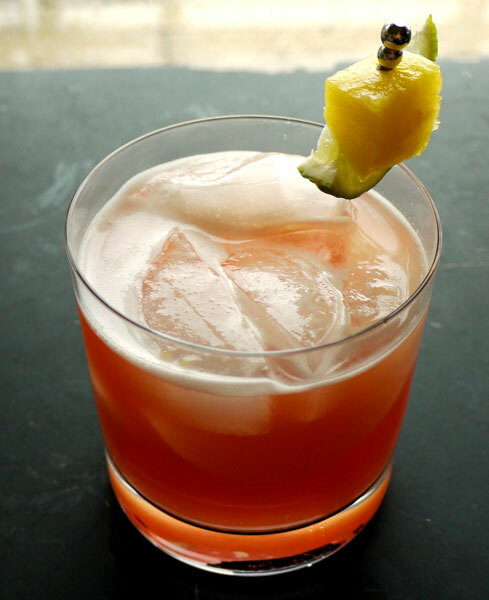 The original cocktail recipe calls from dark Jamaican rum. I substituted Cruzan Dark rum instead, honestly I am very green when it comes to rum and couldn’t tell you what the differences are. So for differences and Rum love, check out these blogs here and here. I also changed the garnish from an orchid, and a cocktail cherry, lemon, and orange wheel to the lime wedge and pineapple. Generally I like the garnish to either be a hint of what’s in the drink or to complement it somehow. Also, I didn’t have any orchids in my possession at the time. Tasty notes on this: the Campari mellows way out in here (I’d even consider upping it to 1 oz next time to try), while the fruit juices make it sweet and tangy. 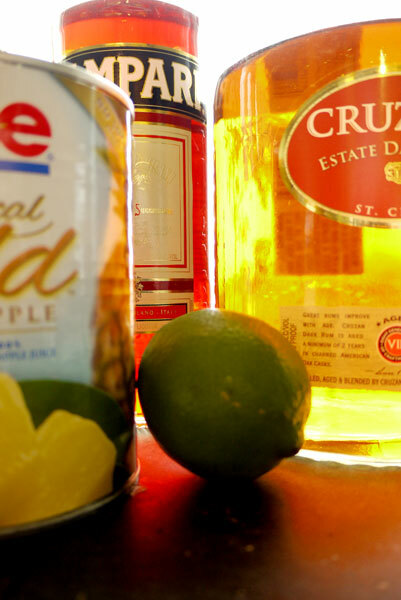 While the rum has to be playing a role here, it takes a back seat as far as flavor. One last note- don’t be generous with the ice. I used an unusually large (well, at least for me) rocks glass here and filled 2/3 with ice. Once that ice started to melt it began to wash the flavor out a bit. Don’t let that happen to you! Use less ice or tip that baby back quick!